Added Chess. Much thanks and credit to Anahera for originally authoring this code! Added Tailoring. Much thanks and credit to Phenyl for originally authoring this code! Appraised items on housing hooks now show the details on the hooked item. Support AdvocateItem changing/updating Radar Blip Color in similar fashion to retail servers. fixed bug causing disconnects due to NAK requests being ignored. Change action that occurs for selling items to vendors so they appear in the buy window if they aren’t destroyed on sell. Prevent selling objects (via drag-drop on vendor) that vendor doesn’t accept in its MerchandiseItemTypes field. These same items would red-circle using traditional drop into panel method. Update Logout to include server population and limits when character list is resent. Updated @acehelp and @acecommands to not be individual messages, so not to be broken up by other chat spew. Added @pop command — Tells you how many players are online. Added @telereturn — Teleport a character to their previous position saved when using @teletome. Added @watchmen command — Displays accounts of a specific access level. Added @finger command — Displays information about a character and/or account. Exclude Burden in CreateObject messages for Creatures. Update Player Description Event to reflect WeenieType and HasHealth accurately and not hard-coded values. To contribute to bug reports or simply check out the progress, log in to Coldeve via Thwarglauncher. Fix wield issue with TwoHanded weapons. Changed GenerateTreasure to check for null DeathTreasure and de-duped generate code so that items weren’t generated twice upon death. Add support for spawning Treasure pile corpses when data indicates it should. The emulator now has 100% of the player skills available! Added complete Summoning player skill system! Added optional flag for caller to select whether or not to load the cell.dat. Removed ActionQueue.Dequeue architecture, as it was unused. This change reduces the CPU ActionQueues require by half. Update EmoteManager and WorldObject Generator with fixes for Anniversary event emotes. ACViewer is currently a work-in-progress, multipurpose DAT file viewer for Asheron’s Call portal and cell DAT files. 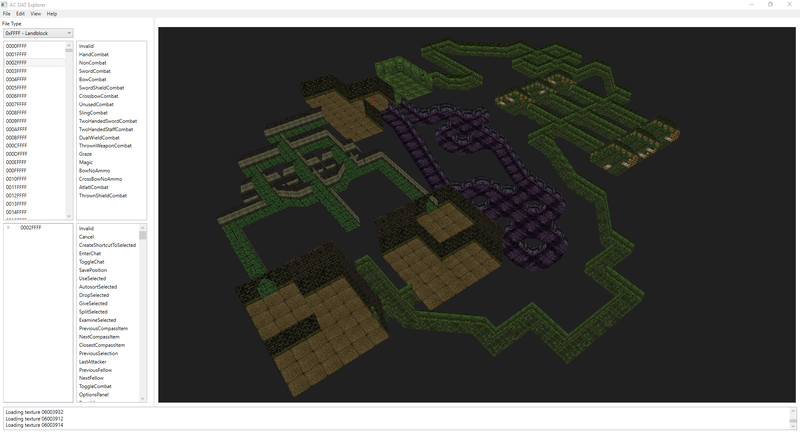 With this tool today, you can view many of the objects contained within those files, including object models, particle effects, textures, images, sound files, and landblocks which include over-world landscape and dungeons. The above pictures represent only a sample of what you can view with this application right now and there are plans for many more features to come. 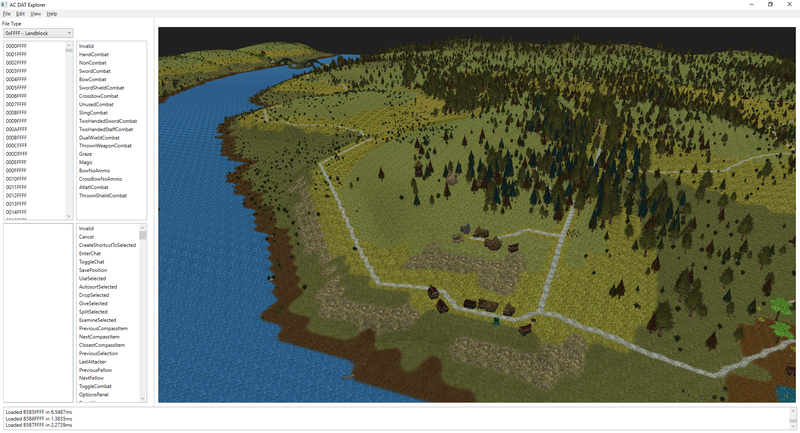 Eventually moving towards DAT modification and even a full-on WorldBuilder like functionally for new content development! Click Here to download ACViewer! Visit the GitHub website to download this tool and explore Dereth in new ways today! You can also click on the Discord link to the left to keep up with our changes to this new app as well as our other projects. 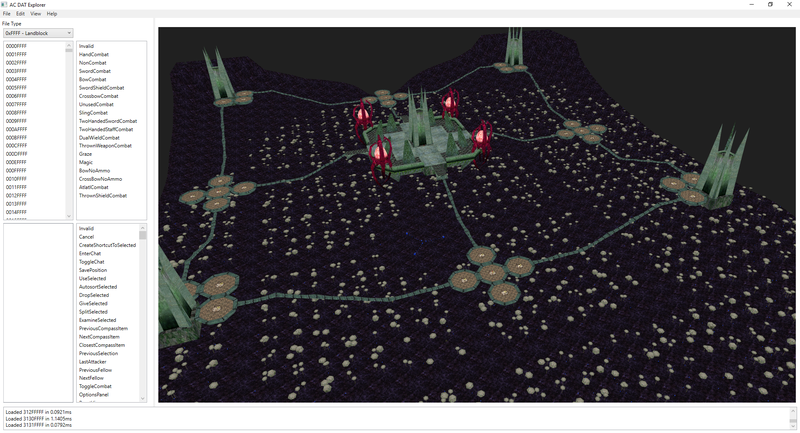 Progress is made nearly every day on all things Asheron’s Call emulation. Stay tuned for future announcements about our first downloadable releases of ACEmulator server software, in addition to the source code repo downloads! Happy 19th Anniversary, Asheron’s Call! Nearly two years after shutdown, ACEmulator is still going strong, making progress and improving week to week! Today we mark the 19th anniversary of the portals opening to Dereth with a few minor “events” in our emulated worlds. Make sure you download the latest version of the world database and update your local copy to experience some of the “classic” moments of past anniversaries, but don’t wait too long as these events are time limited! 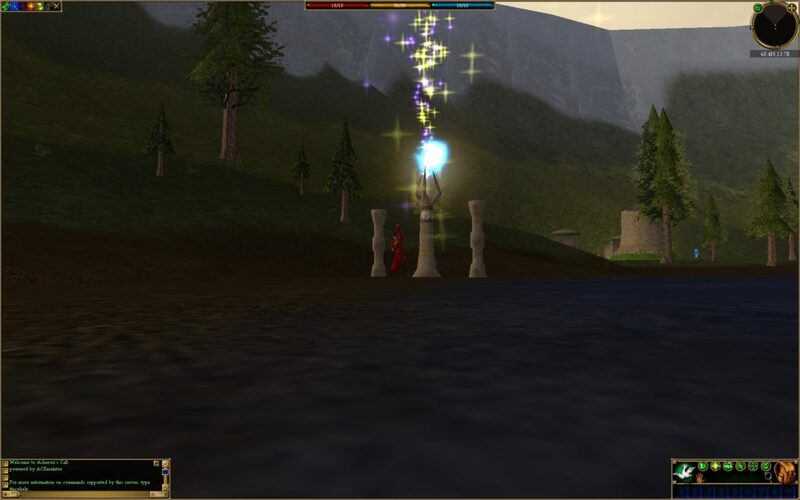 Author RipleyPosted on November 2, 2018 November 3, 2018 Categories UncategorizedLeave a comment on Happy 19th Anniversary, Asheron’s Call! Added attribute mod to monster damage. Some monsters now deal significantly more damage, so beware! Significantly improved GetBiota performance from the shard by using flags to indicate populated collections. Also added Parallel.ForEach support for Shard GetPlayerBiotas. Adding physics entity caching system. This provides massive improvements with reduced memory usage, especially over the course of a lifetime for long-running servers. Shard schema changed to remove foreign key link between Character and Biota. This also significantly changes the relationship of Session/Player/Character objects. Change from .NET Core 2.0 to .NET Core 2.1. This requires .NET Core 2.1 x64 SDK. Major schema refactoring + changes for World and Shard.